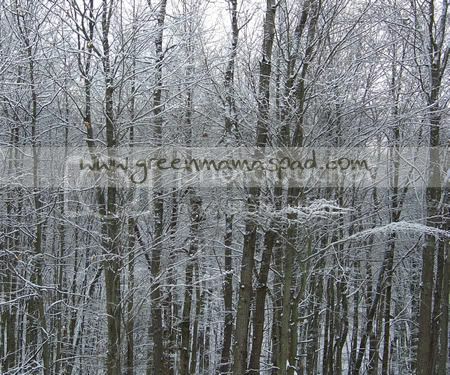 Back in February, I posted a list of my "Green Goals for 2009". Just a few things I wanted to do or change in order to be more green. Now that 2009 is over, I thought I would take a look back to see how I did. So below is each item from my list with commentary (in red) on if I succeeded or not. Buy produce from local farmer's market. Fail. Did not go at all, not even once. Shame on me. Bring reusable bags to ALL stores, not just supermarket. Fail. I always remember them for grocery shopping, but still forget when it comes to other shopping like at Target. Get my hubby to use natural personal care products (shampoo, cologne, shaving stuff, etc.). Not gonna happen. He's a lost cause. Spend more time outside with the kids. This was going well until I started to get huge and pregnant. Start taking better care of me (exercise and work on my chocolate addiction). The year started off well with me using the Wii Fit every day. But then I stopped. Eliminate all High Fructose Corn Syrup foods from our house (95% there!). Pass!! No more HFCS for us! Start a vegetable garden and plant at least 2 veggies. I'm giving myself a pass on this. I started a bunch of seedlings inside but accidentally left them on the deck in the cold spring and they did not survive. I did however plant some grape tomatoes which were yummy! Get a strawberry pot and plant some strawberries. Pass! The strawberries were beautiful, but did not taste all that great. Put up a clothes line outside to start line drying some things like towels. Fail. Hubby wasn't going for this. Fail. I did cut back on waste, but not all. I still send a YoKids yogurt, a milk box and juice box. Too much garbage. So overall, I did not do so great and I am bummed about that. I could definitely improve in a lot of areas here. Now I have to work on my Green Goals for 2010. Since no one will probably be around the rest of the week or this weekend, I'll post that next week. So that gives YOU ALL some time to think about what your Green Goals are going to be so you can share them with me. Yes, this is my house. 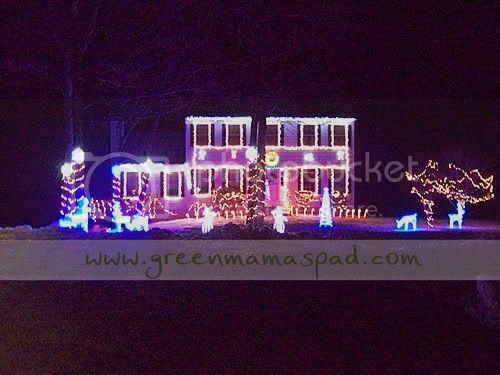 My husband loves his Christmas lights. There is nothing eco-friendly about this I hate to admit. However, about half of the lights are LED, does that count? 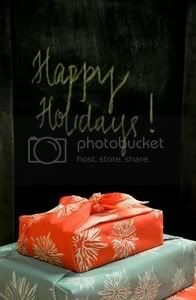 I have another great giveaway brought to you by UPrinting.com! UPrinting.com offers a variety of online printing solutions at affordable prices. From Business Cards and Flyers to Postcards and Wall Graphics - they have everything! UPrinting.com is giving me 100 Postcards and I am so excited because I am going to use them for birth announcements for our new baby boy! I'll just have to go out and get some envelopes. I have ordered business cards on 2 occasions from UPrinting.com and both results have been awesome, so I can't wait to order my postcards! One (1) winner will receive 100 Postcards from UPrinting.com! Leave me a comment telling me how you will use the Postcards if you win. You must also leave me a valid email address as the coupon code with instructions will be emailed to you. This giveaway is open to US Residents 18+ only and will end on Saturday, January 2nd at 11:59pm EST. One winner will be chosen at random using Random.org and will be posted on the Winner's Announcement Page. Winner has 48 hours to claim his/her prize otherwise a new winner will be picked. You must leave your e-mail address in all of your comment(s) so I can contact you. I will not share your e-mail address with anyone, it will strictly be used to notify you if you win. Good luck! Please note that the opinions and views expressed in this review are my own and based on my personal experience with the product and/or company. You may encounter a different experience with this than I did. UPrinting will be providing me with a set of`postcards and is providing a set for the giveaway. So I realize that I kind of dropped off the face o the earth for a few days there. I have good reason, I swear! On 12/17, my due date, I went into labor and had my little baby boy! We just got home Saturday afternoon and are getting adjusted to life with 4 boys. I promise to post a birth story and more information in a day or so. Right now I am trying to get caught up on everything. I also have a winner I need to pull and post, is coming shortly. For companies awaiting reviews to be posted, I am working on them and will get them up as soon as possible! Sometime after I became a stay-at-home-mom, I fell into a frumpy rut. Yes I became part of the stereotype - the mom who rarely wears makeup and barely has time to shower. When I decided to ditch chemicals and start buying more eco-friendly things, my toxic makeup was some of the stuff to go. Now while I have replaced that makeup with natural options, I have 1 natural eyeshadow and 1 natural eye liner, I had yet to find a natural lipstick that I liked. So on the rare occasion that I actually wore makeup, I had to go with the bad stuff. I was recently introduced to FaceFacts by Lori, a company that makes natural, high quality lipsticks and lipliners. FaceFacts was founded by professional makeup artist and mom of 6 Lori Hoffmann. "Always a student of beauty color palettes, and an active participant in the growing natural products trend, Lori has committed her vision, resources, and talents to create a unique color cosmetic line using the highest quality, all natural ingredients that also provide tangible functional benefits." 100% Natural, color-rich, longwearing, ultra emollient formulation in shades ranging from natural beiges and browns to vivid plum and burgundy. The creamy base conditions lips and provides a stay-put stain. Botanical ingredients provide nourishing moisturizers, smoothing waxes, non-greasy oils, and vitamins. Our White Stick contains a high brilliance and iridescence which customizes the other shades when applied beneath or on top. Gently scented with Ylang Ylang. Lori was kind enough to send me a few of her LipFacts lipsticks and lipliners to try out. Let me start off by telling you a little bit about the eco-friendly packaging. The paperboard boxes that the makeup comes in are manufactured using renewable wind power energy, are FSC certified, free of elemental chlorine and are recyclable. The makeup itself is 100% natural, not tested on animals and made in the USA. They are also free of parabens, mineral oil, petrolatum, certified dyes & lakes, and lead. The LipFacts lipliner pencils are made from sustainably harvested California Cedar Wood. I has requested the Berry Mauve lipstick to try out and Lori sent me some lipliner to go with it as well as the Ivory Frost lipstick which she told me can be applied over any other lipstick color to create a new color. Fun! The first thing I noticed about the lipstick is how creamy it is. I hate lipsticks that dry out my lips, and it has happened, but this went on very nicely. I was also impressed with how long the color lasted. On the first day of trying these out, I went to an NHL Hockey game (NJ Devils) and my lips still had a nice amount of color when the game was over. Now for the Ivory Frost, I will admit I was a little skeptical at first of how it would look over the Berry Mauve. But I went for it and tried it out and I was pleasantly surprised. It softened the color a little and gave it a subtle sparkle. I tried my hardest to get pictures of the difference, but its pretty hard taking pictures of your own lips. Here are my lips with LipFacts Berry Mauve Lipstick and LipFacts Hazelnut Lipliner. A nice color for my complexion. The picture really does not do it justice. It is darker in real life. Now here are my lips just moments later with the LipFacts Ivory Frost Lipstick applied over it. I know it is extremely difficult to see a difference, but I swear there is one. It is a little lighter with a nice shimmer to it. Overall I was very pleased with both the lipsticks and lipliners. As of right now the only products that FaceFacts offers are these LipFacts lines, but they do have plans for more makeup down the road. Keep your eye out BodyFacts, CheekFacts, EyeFacts, HairFacts and SkinFacts. You can purchase the LipFacts products directly at the FaceFacts website. Visit FaceFacts and tell me which color lipstick and lipliner you would choose if you won. 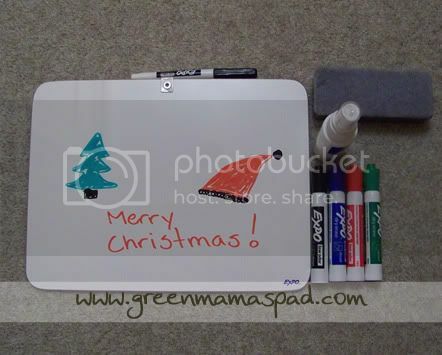 - Follow @GreenMamasPad on Twitter and and tweet this giveaway. You must have at least 50 followers and include a link to this post. You can tweet once daily. Leave link to tweet in comment. - Become a fan of FaceFacts on Facebook. This giveaway is open to US Residents 18+ only and will end on Wednesday, December 30th at 11:59pm EST. One winner will be chosen at random using Random.org and will be posted on the Winner's Announcement Page. Winner has 48 hours to claim his/her prize otherwise a new winner will be picked. You must leave your e-mail address in all of your comment(s) so I can contact you. I will not share your e-mail address with anyone, it will strictly be used to notify you if you win. Good luck! Please note that the opinions and views expressed in this review are my own and based on my personal experience with the product. You may encounter a different experience with this than I did. FaceFacts provided me with an item for review and is providing an item for the giveaway. This week's Wordless Wednesday is dedicated to Shellie and Bryson Ross. Our wonderful community of bloggers over on MomDot are all lighting a candle for them. (The only candle I own is a tea light). Shellie, please know that you are in all of our thoughts and prayers. 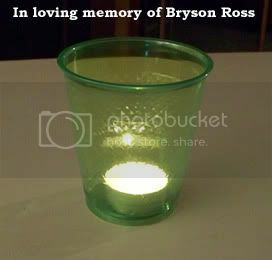 If you lit a candle for Shellie and Bryson, please leave your link below. I ask that only relevant links be added. A fellow mom and blogger and her family is in need of your prayers today. Over the past few months I have had the pleasure of getting to know Shellie over on the MomDot forums. She is a wonderful woman. A military mom with her husband on his way to Iraq, they had just completed a move into a new house. Then yesterday the unthinkable happened. Shellie's precious 2 year old son passed away in a tragic pool accident. My heart aches for Shellie and her family. I wish I could take away her pain. I wish I could go back in time and change what happened. I feel so helpless. Shellie, please know that we are all here for you during this difficult time. Lean on us for support and tell us what you need and we will help you. We love you. I ask all my readers to pray for Shellie, her family, and her precious angel Bryson. If you would like to send a card, Trisha at MomDot is collecting them to send to Shellie at the end of the week. And now I ask that you go and hug your own little one. The one thing I dislike about the holidays is all the waste created by wrapping paper. I don't want to skip wrapping because the kids love tearing the presents open Christmas morning. 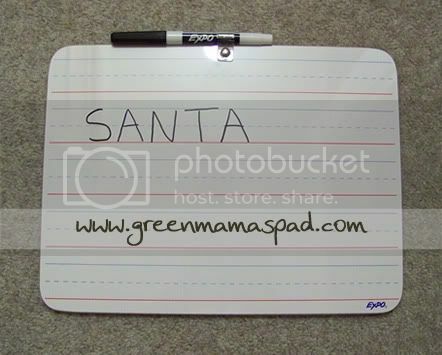 Last year I thought I found a good thing when I bought wrapping paper labeled as "recyclable". Just to be safe I called the garbage company to ask if I could put wrapping paper in our bin and I was told no. Boo. 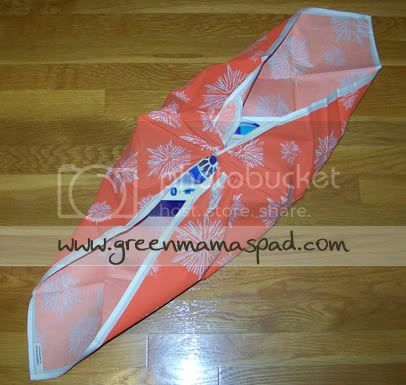 The best solution, I think, is to invest in some reusable wrap like fabric wraps. Chewing The Cud has a line of reusable fabric wrap that are hand printed on 100% organic cotton using soy-based inks. There are a variety of styles to choose from: Give Cheer (shown left and below), Give Joy, Give Luck, Give Wisdom and Give Love. 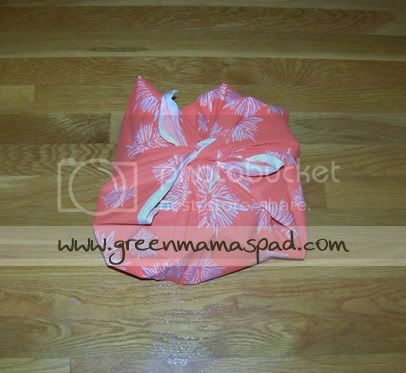 I was sent one Give Cheer wrap in Persimmon to try out. Now I have to say that I am HORRIBLE at tying bows and such. Luckily, the fabric wrap came with an easy instruction sheet to show me how to tie the fabric. Mine still does not look at professional as the picture above, but i think it looks pretty cute! I would love to have a Christmas tree with tons of fabric wrapped presents underneath it. It would be so pretty! OK, so here are the steps I took and my final result. With a little practice I am sure I will get better. But even though it is not perfect, I still love the way it looks. And more importantly, it can be reused countless times! 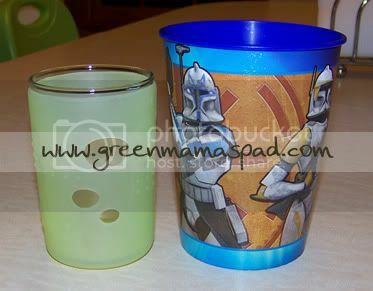 Making the transition from sippy cups or straw cups to regular ole cups can be a little intimidating. Well, at least for this mama who worries about spills and breaks. My almost 5 year old uses a stainless steel straw cup most of the time, but I realize I need to get him used to drinking from normal cups. The last thing I want to do is give him one of our Fiestaware glasses so I have been using questionable plastic instead. Silikids has come up with a much better solution. Silikids was founded in 2006 by two moms who were concerned about toxic materials in children's products. They make a variety of safe silicone accessories for kids from bibs to bottle covers. ~ Non-porous therefore does not harbor or promote bacteria growth. ~ Does not contain toxic chemicals like BPA, lead, PVC and phthalates. Recently, Silikids came out with their Siliskin Glass Cup. This glass cup is 6oz and is placed in a silicone cover (available in lime or aqua). I was sent one of these cups to test out. The first thing I thought when I received it was "wow, it is so tiny!" It wasn't until I saw my son hold it that I realized that this is actually the appropriate size cup for his little hands. Let's look at it in comparison to the plastic cup we were previously using. When he holds the plastic cup you can see it is difficult because it is so big. The majority of the time I would give him a straw to make it easier, for both of us. 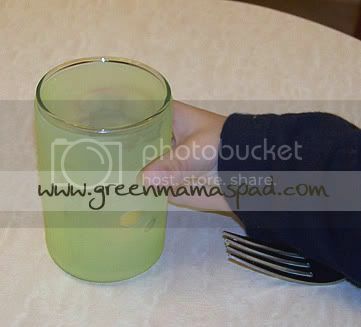 With the Siliskin Glass cup I do not have to do that. It fits in his hand much better and the silicone cover provides a nonslip grip so it is easier for him to hold. The silicone cover will also provide protection to the cup for small drops. Though I cannot attest to this personally since he hasn't dropped it yet (I shouldn't have said that) and I am hesitant to chuck it on the floor myself as a test. What did the preschooler think? He was actually very excited to try out his new big boy cup and we have been using it every night at dinner time since we received it. I love it because it is free of toxic materials like BPA and phthalates and I honestly don't know if the same is true for that darn plastic cup. Receive 15% off of your order at Silikids by using coupon code OHBABY at checkout. Offer expires on 12.31.09. One (1) winner will receive a Siliskin Glass Cup. Visit Silikids and tell me what other products of theirs you like. 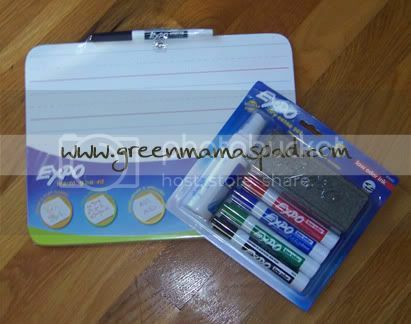 - Follow @GreenMamasPad and @Silikids on Twitter and and tweet this giveaway. You must have at least 50 followers and include a link to this post. You can tweet once daily. Leave link to tweet in comment. - Stumble one of my non-giveaway posts and tell me which one. 2 entries. - Become a fan of Silikids on Facebook. This giveaway is open to US Residents 18+ only and will end on Saturday, December 26th at 11:59pm EST. One winner will be chosen at random using Random.org and will be posted on the Winner's Announcement Page. Winner has 48 hours to claim his/her prize otherwise a new winner will be picked. You must leave your e-mail address in all of your comment(s) so I can contact you. I will not share your e-mail address with anyone, it will strictly be used to notify you if you win. Good luck! Please note that the opinions and views expressed in this review are my own and based on my personal experience with the product. You may encounter a different experience with this than I did. Silikids provided me with an item for review and is providing an item for the giveaway. Do you need to stock up on some cloth diapers, cloth wipes or other diapering accessories? Or maybe you would like to give a gift of cloth to someone this holiday season (hint, hint). Great Lakes Diaper Company is having a 4-day storewide holiday sale. Save on popular brands like Fuzzi Bunz and Gro Baby. Perricone has an amazing line of skin care products, ranging from products for acne to ones for wrinkles. In search of some Perricone Specials or a Perricone Coupon? On the Perricone blog you will find a list of their current specials and promos as well as any coupon codes they may have. One of the specials you will find there is the Radiance & Glow Holiday Set. "A multi-purpose product that provides natural translucent coverage, corrects skin undertones, instantly smoothes fine lines and boosts skin's natural moisture throughout the day, all the while delivering antioxidant benefits. 1oz"
"A Powerful, dermatological-grade face treatment combining Dr. Perricone's most effective anti-aging ingredients in higher levels than present in any Perricone MD product to deliver a lifted, tightened, defined, contoured and radiant appearance. 2oz"
"A lightweight, superior facial moisturizer formulated with powerful antioxidants to help firm skin's appearance and minimize fine lines and wrinkles. 2oz"
One (1) winner will receive a Radiance & Glow Holiday Set, valued at $160! Leave a comment telling me why you feel you need a product like this for your skin type. 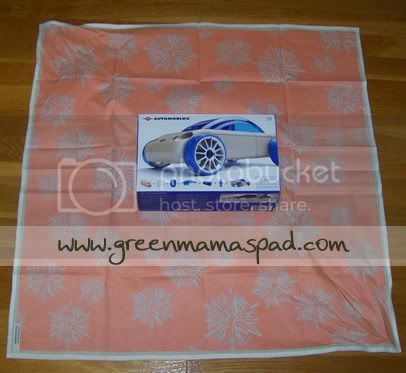 - Follow GreenMamasPad and Perricone MD on Twitter and and tweet this giveaway. Your twet must contain a link to this post and you must have at least 50 followers. You can tweet once daily. Leave link to tweet in comment. This giveaway is open to US Residents 18+ only and will end on Monday, December 21st at 11:59pm EST. One winner will be chosen at random using Random.org. Winner has 48 hours to claim his/her prize otherwise a new winner will be picked. You must leave your e-mail address in all of your comment(s) so I can contact you. I will not share your e-mail address with anyone, it will strictly be used to notify you if you win. Good luck! 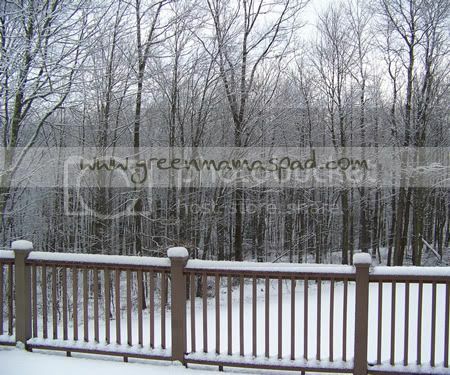 We have been lucky to have an unusually warm fall here in New England but the super cold weather is just around the corner. In fact, I think there is some snow in the forecast for this weekend. Once we get into the thick of winter around here, it can get pretty cold. I hate the cold, HATE it, but I never even thought about wearing warm underwear or "long" underwear underneath my clothes before. It kind of seems like a no-brainer though, I should be wearing something! Cuddl Duds offers a nice range of cute and cozy warm underwear for us ladies who want to layer up this winter. One of the collections they have is EcSsoft which is made from eco-friendly Bamboo. I was sent a pair of pants and a long sleeve shirt from the EcoSoft collection to test out. Unfortunately, I am pregnant and huge and cannot wear them just yet. But that is all going to change in a few weeks and I can't wait to slip these on. Now I have never owned any clothing made from Bamboo so I had no idea how soft these were going to be. By far the softest clothing I have ever felt. I also really love the blue color of the ones that I received. I now have some motivation to get rid of the baby fat so I can actually wear these. When I initially received these I was 9 months pregnant and obviously did not fit into them. Thanks to nursing and a dairy/soy free diet I quickly lost that baby weight and was able to fit into me Cuddl Duds this winter. And let me tell you it has been a BRUTAL winter in New England. 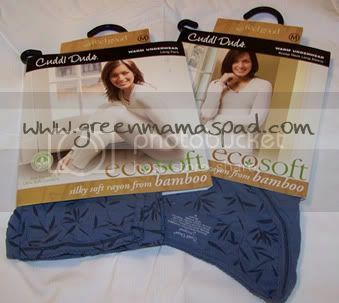 I wore my EcoSoft Cuddle Duds many times. A few days I layered them under my clothes and snow gear when going out to play in the snow with the boys and they kept me nice and warm. 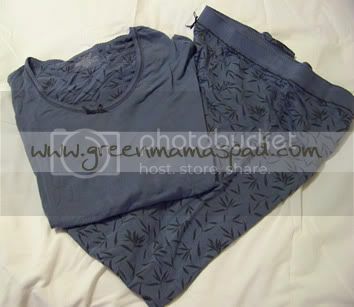 I also used them as pajamas and on super cold nights layered them under my PJs and I always felt nice and toasty. As I mentioned above, these are so soft and very very comfy. Now I need to add more bamboo clothing to my wardrobe! Cuddl Duds are available on Amazon or you can visit www.cuddlduds.com to check out all of their collections of warm underwear. Please note that the opinions and views expressed in this review are my own and based on my personal experience with the product. You may encounter a different experience with this than I did. Cuddl Duds provided me with an item for review however this had no effect on how I wrote this post. This post contains affiliate links.